Trauma Life Essential Oil Relieves Emotional Stress! Trauma Life Essential Oil lends a helping hand in any difficult or stressful situation. It is an excellent blend to soothe "high" emotions or bring peace. Use it to deal with grief, or as a natural remedy for stress! There are so many uses in the emotional category I can't list them all here! Are you dealing with any emotional stress from the past? Try Trauma Life oil! It may help to release buried emotional garbage when used with other modalities. This is why it is so effective for emotional release work for humans and animals. I have had horses that come from poor situations that have moved on to new owners and are doing extremely well! When I need to de-charge a situation it is one of the first oils I reach for along with Peace & Calming blend. It is emotionally calming and grounding which is good when everyone around you is hitting the "panic" button. The animals in these situations relax immediately; just seem to know that it is helping them deal with the situation. If there is a lot of chaos in your home or work place, I would consider diffusing it. Or if you have any children that need to unwind. I am not so sure that you will love the smell, but you will certainly love the support! Use it with Peace & Calming, Joy or Into the Future to magnify the effect! This is a fun and easy reference guide for Trauma Life Oil Blend. It will tell you how to use your oil blend and what to use it for. It will also provide you with some fun tips and testimonials! Want to Purchase Therapeutic Trauma Life Essential Oil? Go to the Oil Shop! Buy Trauma Life Oil Here! What is in Trauma Life Essential Oil Blend? 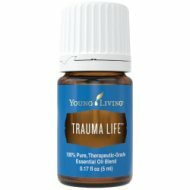 There are ten different oils in Trauma Life oil blend. They are listed below along with a brief description of each oil. Please Note that Trauma Life oil was revised in summer of 2012 because of the deforestation and limited availability of Rosewood Essential Oil. See below for revised formula. Valerian Essential Oil (Valeriana officinalis) from the root has been used for centuries. During the last three decades, it has been clinically investigated for its relaxing properties. Researchers have pinpointed the sesquiterpenes, valerenic acid, and valerone as the active constituents that exert a calming and restorative effect on the central nervous system. German health authorities have pronounced valerian to be an effective aid for the body's needs. Lavender Essential Oil (Lavandula angustifolia) can help you relax, wind down before bed and even ease stress. Its balancing properties are very comforting especially when diffused. Rosewood Essential Oil (Aniba rosaeodora) is soothing to the skin, it is emotionally stabilizing and is used for relaxation. Kaffir Lime (Citrus Hystrix) contains aldehydes and esters that have calming properties. What are the Documented Uses for Trauma Life Essential Oil? Acceptance, agitation, anger, animals (abandoned, poor or negative homes or situations), balance, emotional blocks, calming, calming children, death of loved one, deprogramming, fear, loss, overcome difficult situations, release, negative emotions, peace, relaxation, restlessness, sedative, unwind before bed and stress. What is the Spiritual Influence? Trauma Life goes to the root of the problem when we are blocked energeticly due to past experiences. It will help us release anger and resentment towards negative events. In these situations the oils of Inner Child, SARA and Release may also be effective, either separate or combined. It also helps those who feel sorrow or grief for a loved one or animal. In this case I would diffuse or add Joy as well. Either way, this oil helps us overcome difficult situations by releasing the emotional edge that keeps us stuck. It is welcome at my home or barn on any day. Can this oil be used for Animals? Yes, I have had great results with this oil! See the introduction for details. What are the Safety Precautions? Trauma Life essential oil may have possible skin sensitivity. Dilution recommended. Dilute before using on sensitive areas such as the face, neck, genital area, etc. Place few drops on your hand and pet your dog head to tail if he/she is restless or to promote relaxation.